Updated at 11:11 a.m. ET: BEIJING — While Americans celebrate the power of the ballot with the re-election of President Barack Obama, China's ruling Communist Party on Thursday launched a tightly orchestrated gathering in Beijing for a transition of power to a new generation of leaders amid tough challenges. To the applause of some 2,000 party officials from across the country, outgoing Party leader President Hu Jintao, 70, reaffirmed in a lengthy speech the party's right to govern, with a ringing endorsement of the achievements during his 10 years in office. In that span of time, China's economy quadrupled in size, leapfrogging to No. 2 from No. 5 in global economic ranking, and amassing the strategic global clout that the country wields today. Over 2,000 journalists were invited to the 18th Communist Party Congress inside the cavernous Great Hall of the People near Tiananmen Square. 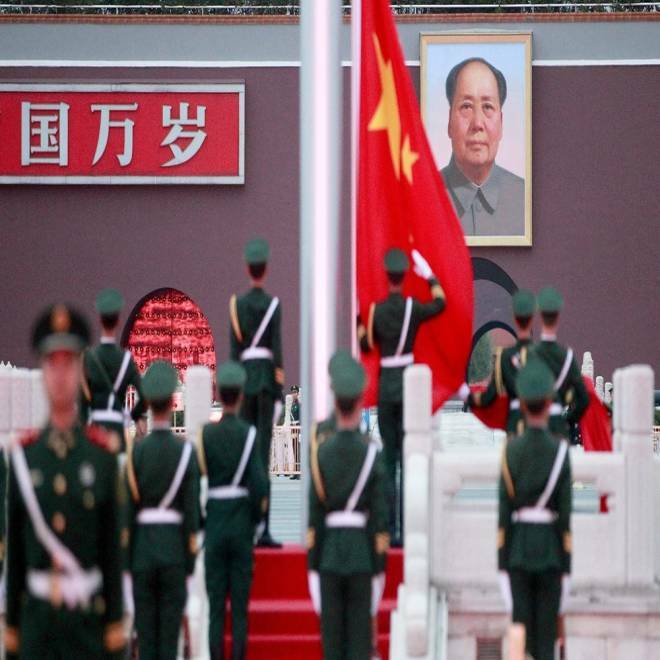 The portrait of late leader Chairman Mao Zedong hangs at the Gate of Heavenly Peace as members of the People's Liberation Army (PLA) salute China's national flag during a ceremony Wednesday on Tiananmen Square as a press conference is held inside the Great Hall of the People on the eve of the 18th Communist Party Congress (CPC) in Beijing, China. The week-long event is expected to culminate in the election of Xi Jinping, 59, as China's next top party leader. And when China's parliament convenes early next year, Xi is expected to be named China's president, acquiring by then the full authority with which he will co-manage with Obama the delicate course of Chinese-American relation. The striking contrast between the Chinese and American models of governance, which were playing out at the same time, was certainly not lost to the media handlers of the Chinese party congress. In a pre-congress media event, NBC News posed the issue of whether China will eventually adopt democratic reform and popular elections. ''The leading position of the Chinese Communist Party is a historic choice, a people's choice,'' responded Cai Mingzhao, the congress spokesman, dismissing any prospect of multiparty politics. Hu's swan song Thursday reinforced China's path of gradual reform, which prizes harmony and stability in times of rapid change. Still, China observers concede that a smooth party congress will mark only the second peaceful transfer of power in Communist China's otherwise tumultuous history. Before the 2002 change of leadership from then-president Jiang Zemin to Hu Jintao, all succession plans involving the designated heirs of Chairman Mao and even Deng Xiaoping ended up in bloody and tragic power struggles. China's leadership transition is also seen as a vindication of China's reform that sets an age limit on top leaders, a practice not yet adopted by other modern nations, according to scholars. Despite China's enormous gains in the past 10 years, the jury is out on the legacy of Hu and his close political partner, Premier Wen Jiabao. ''They have laid the foundations of a meaningful social safety net, in terms of health insurance, retirement pensions, unemployment benefits, and more recently subsidized housing while keeping a rather high economic growth rate,'' said Jean-Pierre Cabestan, a professor of government and prominent China scholar at the Hong Kong Baptist University. ''But 'lay the foundations' is important because a lot remains to be done in terms of reimbursements and coverage,'' Cabestan told NBC News. ''Hu has introduced a series of very important concepts such as scientific concept of development, harmonious society, and pro-people approach but has yet to implement them,'' said Bo Zhiyue, expert on China's elite politics at the National University of Singapore. Premier Wen represents the ''human face'' of the Chinese communist leadership, according to Li Cheng, a top China scholar of the Brookings Institution. ''Some critics may doubt the sincerity of Wen's human face, but it was effective among a vast number of farmers and migrant workers in the country, especially for groups like AIDS orphans, coal-miners and families of earthquake victims,'' Cheng said in an earlier email interview. CNBC's Michelle Caruso-Cabrera reports on China's selection of new leaders to meet public calls for better government and give the economy a boost. ''Liberal intellectuals in the country consider Wen as the most important political ally, especially for Wen's long-standing argument for universal values of democracy,'' he added. However, recent reports of corruption involving family members and a protege seem to have tarnished both Wen and Hu, with Wen reportedly urging an investigation into alleged hidden family fortunes to clear his name. China's new leadership to be announced next week promises to be ''the most diversified generation of leaders,'' Cheng said. ''This diversity can be found in the leader's educational backgrounds, in their career paths, in their policies and world views,'' he further said. And for Xi Jinping, who will head this leadership, maintaining ''delicate balance on several fronts'' will be the key challenge. ''How to crack down on the vested interest groups of state-owned companies but not undermine the national competitiveness and lose the support of this key power base of the party? How to be seen as the top leader who places China's national interests above anything else but at the same time maintain a good personal relationship with the United States? How to satisfy the bureaucratic interests of the military but avoid a military conflict in South China Sea, East China Sea or elsewhere? How to pursue some bold political reforms but not lose control?'' are the tough choices, according to Cheng. ''Anti-corruption, clarifying the division of labor between the party and the government, and establishing the rule of law'' are the top challenges, according to Zhiyue. Cabestan however cited ''regime legitimacy after the avalanche of corruption scandals'' as a major issue. ''He will need to reform in order to consolidate and save the regime but at the same time he will have to overcome huge obstacles and hurdles to succeed. A kind of mission impossible,'' Cabestan warned. NBC Researchers Johanna Armstrong and Liu Yanzhou contributed to this report.